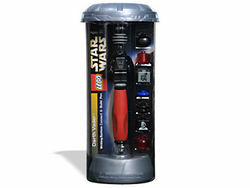 1709 Pen Darth Vader is a Star Wars pen released in 2002 released under the LEGO Writing theme. It contains a Darth Vader minifigure. This was one of the first pens ever realesed by LEGO. Facts about "1709 Pen Darth Vader"
This page was last edited on 9 February 2019, at 16:28.